Emily said: "English-language bookshop on Salvatorstrasse. This shop is the most comprehensive English book store in Munich. It has new releases and an interesting mix of both British and American books. There is also a branch of this shop in Frankfurt." 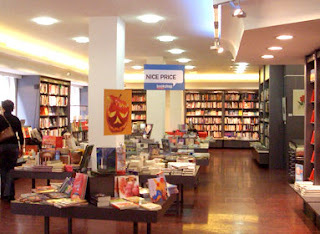 Hugendubel is a chain bookstore operating all over Germany. However, this specific Hugendubel bookstore at Salvatorplatz in Munich is their only location selling exclusively English books (there's another bookstore in Frankfurt with a considerable English section, but that one offers books in German as well). Its great advantage is the favorable location in the very center of the city, between the Marienplatz and Odeonsplatz. Hugendubel bookshop is definitely a great source of English literature in Munich, but it does have some bugs as well. The offer of the bookstore is quite wide, ranging from fiction (mostly new releases and also classics), biographies, history or politics, to traveling, business, books for kids and audiobooks. Some visitors still find the offer of the bookstore to be limited and too “chain-store-like”. The other reproach made against Hugendubel is linked to the prices of the books. However, this is mostly due to the fact that books have a fixed price in Germany and you can't expect any radical deviations unless you decide to visit a second hand English bookstore. The Hugendubel family has a long tradition in the bookstore business, consisting of several generations and more than one full century. The bookstore at Salvatorplatz was actually the first one in the line, acquired in 1893 (there already was a bookstore at this address when the Hugendubel family bought it). The last crucial change in the history of this store came in September 2004, when it was reopened as an “English language only” branch. This branch of Hugendubel has now sadly closed down as of June 2012. However, some other Hugendubel affiliates do have english books' sections.